It’s one of the simplest, easiest and most versatile classic meals — good ol’ fashioned oatmeal. 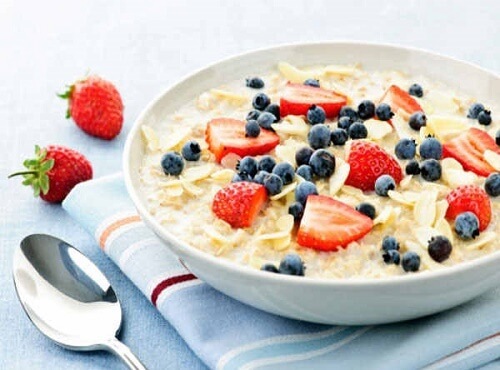 Yet, over the years, because of how it’s grown, milled and packaged, oatmeal has left the plates of many Celiacs and gluten-allergy sufferers. Enter Only Oats by Avena Foods. We carry their certified gluten-free quick-cook oats for less than the price of most chain stores. I probably don’t have to tell you how easy it is to just plug in a hot water kettle and pour it over the oats. But, you can do a few simple things to dress up this classic grain. Simply throw in a handful of your favourite berries or some fresh slices of your favourite fruit (we like fresh raspberries, hand-picked from our edible garden) and sweeten with your choice sweetener (our favourite is certified organic coconut flower sugar AKA coconut sap, by EcoIdeas — which we carry bulk in-store). Sometimes, the fruit is enough and you can leave the sweetener out altogether. This is great, but do I have to do this everyday? Ha! Take the stress and worry out of the first week of school. With just a few Mason jars, you can have a week’s worth of breakfast for the whole fam. Check out Faith Durand’s One Week of Breakfast in 5 Minutes. Simply omit the nuts, or substitute with your favourite organic raw seeds. We like chia, hemp and flax. Turn it into a kid-friendly lunch by layering a thermos with cooked oatmeal, fruit and some nut-free mix-ins. Here’s my daughter’s favourite container. Do I have to explain why? I don’t think any allergen-friendly post can end without a mention of the amazing Oh She Glows cookbook and blog. And if you haven’t already, go over to Twitter and follow Avena Foods. I mean, who else would have the best ideas for Only Oats but its producer? And don’t forget to come in and pick up not just several bags of Only Oats and coconut sap, but all the gluten-free allergen-friendly school-friendly snacks you will need this school-year. *Even though Only Oats is certified gluten-free, please note that it is common for Celiac sufferers to also develop a separate intolerance to oatmeal. Please consult a doctor before re-introducing oatmeal into your diet.